In this Malthael Build Guide, we provide an overview of his strengths, abilities, talents and matchups. Malthael is a melee assassin drawn from the Diablo franchise. In many respects he acts similarly to Tychus in the sense that his kit and his trait revolve around dealing damage based on a percentage of a heroes maximum health. The key difference is that Malthael is melee based, unlike Tychus who is a ranged alternative. Where his kit is concerned, Malthael's is a mix of single target and AOE damage that offers some mobility. What's particularly interesting about Malthael's kit is the fact that he can not only sustain himself through Soul Rip, but can deal massive damage to any composition that groups together. Unsurprisingly, Malthael's ability to deal damage based on a targets maximum health ensures he's a brilliant pick against high-health heroes and in the current meta, with most compositions taking double Warrior, he works exceptionally well. What I will say however is that despite this and his personal sustain (his trait also triggers on minions) is that he offers quite a slow playstyle. Without applying his trait to an enemy, Malthael can't use the rest of his abilities so ensuring you poke with his Death Shroud, before following in with his Wraith Strike and Soul Rip is fundamental to maximizing his damage potential. Finally, be aware that Malthael as a melee assassin has no reliable "out" as his kit and the mobility offered by Wraith Strike is targetted based purely on his trait. Diving too deep with Wraith Strike will see you focused and killed very quickly. Reaper's Mark - Malthael's trait is key to not only activating his abilities, but also allowing him to consistent damage. Without his trait active on a minion or enemy hero, the only ability he has access to is his Death Shroud, a long range attack that applies Reaper's Mark to all foes struck. What's key to remember with Reaper's Mark is that anyone struck by his melee attacks or by Death Shroud will suffer damage over time. The DOT deals reasonable damage to high-health heroes and will last for 4 seconds. Every time Malthael attacks the same target, it will reapply Reaper's Mark and extend the duration. What's important with Malthael is not only ensuring your trait is active on an enemy player at all times, but ensuring that it's active on a Hero that will bring the most value. As a melee assassin Malthael will regularly be attacking the enemies front-line, opposed to their backline, and because of his trait, he can quickly burn down heroes such as Anub'arak and Artanis. Finally, despite his trait returning the highest amount of damage against those with large health pools, it still allows for considerable bonus damage against squishier heroes. Dont only attack the front-line if there's an opportunity to teleport to a high value target. Soul Rip (Q) - Making up a large part of the why Malthael has so much sustain, Soul Rip allows him to deal AOE damage to all those affected by Reaper's Mark. When he does, he'll regain around 36 health for each target hit. If he uses Soul Rip against an enemy hero, this value is significantly increased to 3% of Malthael's maximum health. At level 20, Malthael has 4303 health, allowing Soul Rip to return 129 health per target. In a group encounter and if you land Death Shroud (see below) against multiple foes, Soul Rip can return a large amount of health. What's also particularly interesting about the ability is the fact its cooldown is incredibly low, meaning you can use it twice before your trait expires (unless you're still attacking a player next to you). If you can and when solo laning, try to ensure you use Death Shroud and Soul Rip on as many minions as possible so that you can keep your health topped up. Wraith Strike (W) - As your only form of default mobility, Wraith Strike is incredibly important for Malthael because he's a melee hero with no hard-crowd control. Unlike Alarak who can pull and silence, or Thrall who can root, Malthael relies on Wraith Strike to stick to a target. When Malthael has applied his trait to a target, he can then select them and immediately teleport behind them. This provides Malthael with an opportunity to body-block, but to also reapply his trait and extend its duration for another 4 seconds. Considering its cooldown is only 5 seconds, as long as you land basic attacks after teleporting, you can continue to stick to a player for some time. Alternatively and if they creep away while Wraith Strike is on cooldown, you can quickly land Death Shroud to then buy enough time to cast Wraith Strike again. Be aware however that by default, Wraith Strike has a short range and if the enemy walks away a little too far, you'll be unable to teleport to them. Death Shroud (E) - As the only ability available to Malthael until he applies his Reaper's Mark to an enemy hero or minion, Death Shroud is a slow moving linear projectile that travels forwards. It's key to not only applying Reaper's Mark to multiple foes, but also sets up a variety of combo's for Malthael. Whether marking all minions in lane, which you can then Soul Rip, or to hitting an enemy hero on the back-line, before teleporting to them, Death Shroud has huge potential. Unfortunately the relatively slow moving nature of its projectile means it can be easily dodged if the enemy is anticipating it and with an 8 second cooldown, it's fairly unforgiving. As always and with any slow moving projectile, be sure to lead your shots in anticipation of where your opponent will move. Tormented Souls (R) - Tormented Souls causes Malthael to apply Reaper's Mark to all enemies around him for 4 seconds. It's his only form of AOE damage outside of Soul Rip and is primarily used - certainly what I've found - when you're surrounded by an enemy team. Once you hit level 13 and take Ethereal Existence, Tormented Souls really shines as you can apply your trait continually in a very short time. As long as you dive in once the enemy are softened up, Tormented Souls can finish players off easily (even better with Momento Mori). Last Rites - Malthael's burst heroic, Last Rites is the inverse of Cursed Bullet (Greymane). Allowing Malthael to deal damage - after a brief delay - based on your opponents missing health. For heroes with lots of health, the burst it offers is amazing. As an example, at level 20 Arthas has 5530 health. If you use Last Rites when he has lost half of that, it'll deal 1382 damage. That's absolutely massive in a team fight and is often more than enough to finish off any player with a few more attacks (especially because the damage is delayed by 2 seconds). If that wasn't good enough, Last Rites is a repeatable quest, allowing you to lower its cooldown by 5 seconds per kill. Any player that will die to Last Rites will have a skull and crossbones over their head, so be sure to use it on them for a quick quest point. 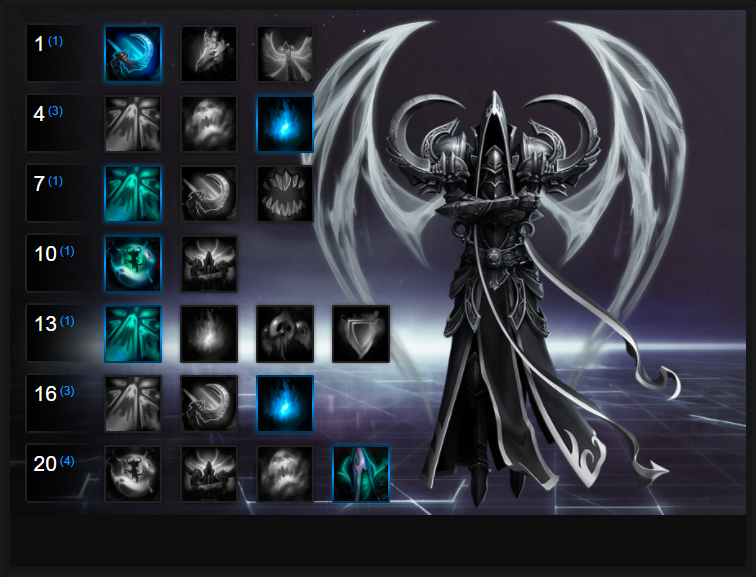 Like our Malthael build guide? You can help support its updates by subscribing to Ten Ton Hammer. Here's the details. Death's Reach is my go-to talent for Malthael, simply because it ensures no one can really escape him once he has cast Reaper's Mark on them. With it increasing Wraith's Strike range by 35% it also means you can chase easier after landing Death Shroud, but also pursue those on the back-line if you land your mark on them. It makes Malthael particularly sticky. Variable: Fear the Reaper allows Malthael to gain a 25% movement speed buff and the ability to pass through enemy heroes. As his only form of escape (unless he manages to snag a minion to leap to with Wraith's Strike) it can be a fantastic choice if you're against a front-line heavy team or a dive composition, as it will ensure you can't be blocked in. It also means that you can run away quickly, before anyone mounts up after you. I will say that Fear the Reaper is a clutch talent that does make poor positioning with Malthael much more forgiving. If you can master effective poke and diving in at the right time, there's little need for it. As a talent that significantly increases the damage and utility of Malthael, Black Harvest is brilliant. The quest talent - once you've landed Reaper's Mark for 150 seconds - elongates its duration to 6 seconds. This might not sound amazing, but it ensures you deal more damage over time and can use Wraith's Strike twice in succession without worrying about keeping your Reaper's Mark active. Cold Hand allows Malthael to slow enemies struck by Soul Rip by 20% for 2.5 seconds. Not only does this allow him to kite easier, and escape if needed, but also ensures when he's going all-in that the enemy team can't escape him. Increasing Malthael's healing from Soul Rip from 3% to 3.75%, Soul Siphon grants incredible self-sustain whether in a team fight or laning. Considering his basic attacks cleave, and if he lands a good Soul Shroud, Soul Rip will keep him alive. Memento Mori allows Malthael to really turn up the damage, allowing him to increase his Reaper's Mark damage by 80% if its been active for 4 seconds. Considering Black Harvest brings it to 6, and as long as you're hitting on enemy players, the damage spike is absolutely ridiculous. Best of all, it's really easy to maintain thanks to Death Shroud and regular use of Wraith's Strike. Acting similarly to Uther's Redemption, Malthael can instantly respawn when he dies thanks to No One Can Stop Death. The only catch is that it summons him back to the Altar, but also elongates his next death respawn timer by 25%. I think that's a fair trade-off for two lives. Take this talent on Battlegrounds where you have to contest often, or if you find yourself under a lot of constant pressure. Variable: Final Curtain allows Death Shroud to remain on the ground once it's cast, for 4 seconds. The trail left behind will trigger his trait against enemies, each time they touch it. It's amazing for area denial, but also zoning out the enemy team. If they have to fight you, they'll have to sit in the Death Shroud taking continuous damage. These Hero Threat Levels (1 being lowest threat and 10 being highest threat) are to help you determine which enemy Heroes can give you a headache. For the Heroes listed here, take extra care as they're particularly dangerous for Malthael. Alarak: His pull, silence, lightning and heroic abilities can cause you problems. If nothing else, he'll pull you out of position and make you an easy target. Arthas: His root combined with his slow aura makes life incredibly difficult for Malthael. You can still take chunks off his health, but your reduced attack speed hurts your damage potential. This list of tips and tricks are just a handful of things we think will help your Malthael play. We'll continue to add to the list as required and if you have any tips you'd like to share, let us know in the comments below and we'll place them here. 1. Remember that you can only use two of your abilities when you've placed Reaper's Mark on an enemy. Until then, you only have access to Death Shroud. 2. Malthael works best against high health heroes simply because his trait deals damage based on maximum health. Effectively, the higher your health pool, the more damage his trait deals. 3. It's a good idea in a team fight to snag as many heroes as you can with your trait. Death's Shrowd applies it, alongside your basic attacks. Having a damage over time on a large amount of the opposition, for 4 seconds, can seriously pressure the enemy support. 4. Soul Rip provides a flat value of healing from minions, but returns 3% of Malthael's maximum health against heroes. If multiple heroes are affected by your Reaper's Strike, ensure you use Soul Rip twice during its duration for maximum sustain and damage. 5. When you've completed your Black Harvest quest (level 4 talent) you'll be able to use Soul Rip 3 times against a target before your Reaper's Strike expires (if you're no longer hitting them). 6. Wraith Strike will always teleport you behind a victim and instantly deal a low amount of damage. Use this opportunity to body-block, preventing the enemy from escaping. 7. If you need to escape in lane, it's sometimes a good idea to send Death Shroud out onto a minion, before using Wraith's Strike onto them. It'll need some distraction on your part, but can work. 8. With the Inevitable End talent, you can dive deep with Wraith's Strike (if you snag someone with Death Shroud) before using your Unstoppable to run back to safety. 9. At the start of any fight try to open with Death Shroud. It's a good opening salvo that'll allow you to use Wraith's Strike on an affected target, to get straight into the fight. 10. Death Shroud really doesn't travel very fast so be sure to aim ahead of your target, so that it's likely to land. 11. The cooldown on Death Shroud is fairly punishing and key to Malthael being able to engage and maintain his trait from afar. Don't waste it and only poke with it if you can reliably hit someone. 12. Remember that Last Rites deals HALF the damage of a heroes missing health, after 2 seconds. Only use it on someone who has taken a fair amount of damage otherwise it'll be wasted. 13. Try to always kill someone with Last Rites - ideally by tagging them when theyre very low health. You want to secure the kills so its cooldown is reduced as quickly as possible. 14. With the Memento Mori talent, don't be afraid to beat on front-line heroes such as Varian. The longer your trait is active for, the more damage you'll deal. No one can stick around under such pressure. 15. Despite having sustain, you're still very squishy and if Inevitable End is on cooldown (or if you don't yet have it) you can die in seconds from a stun or root. 17. In a team fight and when you've activated Tormented Souls (covering a lot of the enemy team), it's a good idea to use Wraith's Strike on a target that's furthest away. This stops you being immediately attacked, creates space and allows you to then dive back in later. Thanks for reading our Malthael build guide. You can help support its updates by subscribing to Ten Ton Hammer. Here's the details.